From J&D's foods, the makers of an entire line of Bacon-flavored (and, ironically, Kosher certified) products such as Bacon Salt, Baconnaise, and Bacon Pop, we now a final resting place designed for the uber bacon lover, the Bacon Coffin. When I first heard about this "bacon and pork" painted, $2,999.95, casket (complete with a bacon-scented air freshener) I couldn't help but think, that the cult of bacon had finally gone too far. I quickly realized, however, that they hadn't gone far enough. First, the recently deceased should be dressed appropriately. 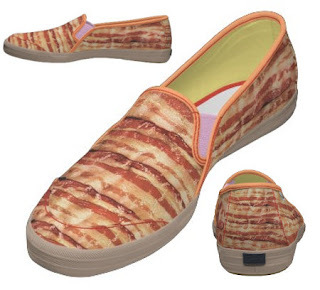 This means a bacon hat, bacon shirt, bacon tie, bacon pants, and even bacon shoes. 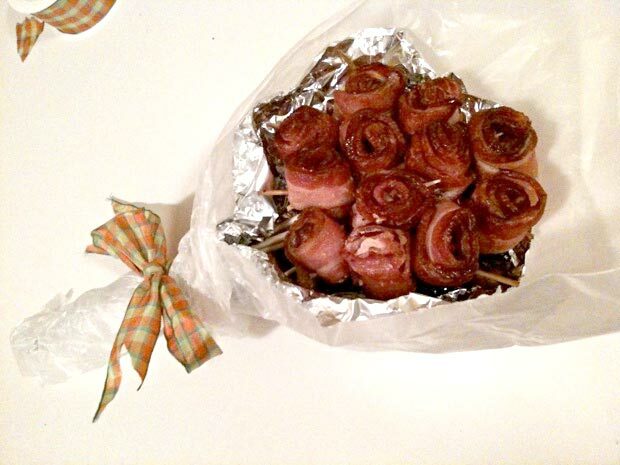 As traditional flowers would be inappropriate for such a ceremony, numerous bacon bouquets will have to be prepared. Third, the coffin itself be made of real bacon, woven into in a lattice-like structure (like the bacon meatza crust). Or, better yet, ditch the coffin concept entirely. 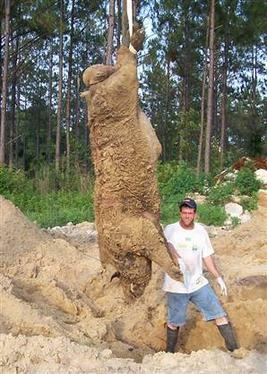 Sub it out for an entire cured pig, a hollowed out Hog-zilla, Applewood smoked and seasoned to perfection. Finally, the bacon coffin shouldn't be buried, but interred rather, in a meat mausoleum built with bricks of bacon. Then, and only then, will the corpse in question be able to RIB (rest in bacon). Chime in on the baconification of, well, everything in the comments section below!